Always read the entire recipe first. Ingredients should be at room temperature unless otherwise stated. Once flour has been added to the batter, mix until just combined. Over mixing will develop the gluten in the flour producing harder cookies. Egg whites should be free of yolk. Beat at room temperature to ensure good volume. Equipment needs to be clean and free from grease. When measuring honey, molasses, or corn syrup, lightly grease the measuring cup. This will allow the liquid to pour out quickly and easily. When deep-frying, only fry a few cookies at a time. Too many cookies will drop the temperature of the oil producing cookies that are oily. When deep-frying always use a flavorless oil. Do not olive oil. It will impart flavor to the cookie. I suggest rolling cookies between two pieces of wax paper. This is because extra flour often makes cookies dry. In addition, it is less frustrating because you don't have to peel the dough off of the rolling pin or the pastry board. To make it easier to lift the cookies off the wax paper, peel away one layer of waxed paper, then put it back on, turn dough over and peel off second layer. You may have to flour the wax paper for really sticky dough. You might also try using powdered sugar rather than flour. When rolling, roll from the center out, turn slightly, and then roll from the center out again. This method will allow more uniformity in the thickness of the dough. Always leave enough room all around the cookies on the cookie sheet to allow the heat to flow freely and cook cookies evenly. Let cookie sheet cool before placing on new cookies. This will keep the cookie from spreading too much. Use light colored baking sheets; darker sheets will make darker cookies. Place cookie sheet in the center of the oven. It is always best to bake one sheet at a time. The cookie recipes will vary in the amount they make depending on the size of your cookies. Store cookies in an airtight container once they are completely cooled (unless specified differently). Store different types of cookies separately. 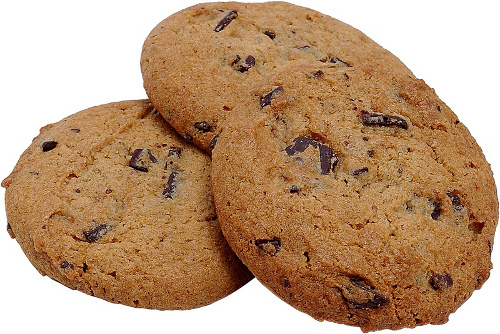 Crisp cookies will absorb the moisture from soft cookies; mild cookies will pick up the flavor from spicy cookies. Most cookies will keep for two weeks but taste best when first baked. Cookies topped or filled with chocolate, cream cheese, or whipping filling should be refrigerated. Assembled Cookies created from ready-made cookies and candies, etc. Bar Batter is pour into a baking pan and cooked, then cut into pieces once cooled. Drop A Cookie made by dropping the batter directly onto a cookie sheet or into hot oil. Formed Any cookie that needs to be shaped, for example into a ball, a log, or a crescent. Molded Any cookie made by being pressed into a cookie mold. Piped Any cookie that requires a pastry page or cookie press to be made. Refrigerator Any batter that needs to be refrigerated for any length of time. Rolled Cookies that need to be rolled out with a rolling pin and cut with a knife or cookie cutters.